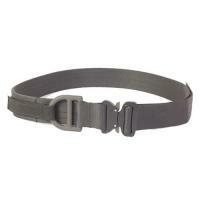 Carry the weight of a fully-loaded combat belt comfortably and with confidence wearing the Cobra 1.75" Rigger Belt. Designed to offer a rigid fit that will not sag or droop, the belt features a reinforced construction and meticulous craftsmanship to deliver superior durability. Two layers of military-grade type 13 webbing are coated with an industrial-strength laminate for optimal rigidity. The two layers are then meticulously stitched together using five rows high-strength 138 nylon thread for a secure hold that will not come apart. With its durable, extra stiff design, High Speed Gear's Rigger Belt maintains its shape when it is fully loaded, providing a consistent and reliable fit. An ultra-durable Cobra buckle guarantees a secure closure that will maintain its hold regardless of load weight or activity. Note: High Speed Gear's® riggers do not meet certification standards for climbing or life-saving.